Purple Diamond is an official participant in the Amazon Packaging Support and Supplier Network (APASS). 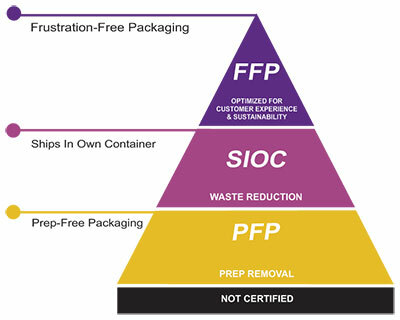 The APASS program was designed by Amazon to help support vendors, sellers and manufacturers to obtain certification of their products as Frustration Free Packaging (FFP), Ships-in-Own-Container (SIOC) or Prep-Free Packaging (PFP). Purple Diamond provides APASS services directly to vendors, sellers or manufacturers related to package testing in compliance with Amazon’s certification test methods & packaging design to comply with Amazon’s packaging guidelines. Frustration Free Packaging (FFP) – is the gold standard of Amazon’s packaging certification and provides packaging that is designed with our customers and the environment in mind. 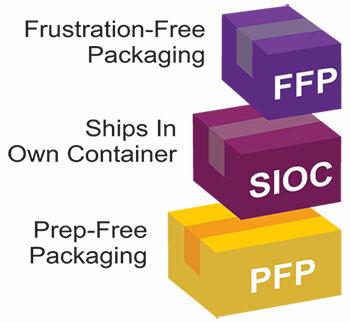 FFP certified packaging is capable of shipping in its own container in minimized and fully recyclable and easy-to-open packaging. This ensures the most optimal experience for our customers. Ships In Own Container (SIOC) – Amazon’s second tier of certification, minimizes waste through ensuring the packaging is designed to ship without the need for an Amazon overbox. Some products require additional protection using non-recyclable packaging materials, such as foams to ensure minimal damage during shipment. Prep-Free Packaging (PFP) – the third tier of Amazon certification is designed for items not capable of shipping in their own container (i.e. liquid product that is not six sided) which require an Amazon applied overbox. A certified PFP package is designed to ship effectively without the need for Amazon to apply additional prep to prevent damage of leakage. We can test and certify your products as Tier 1:FFP, Tier 2:SIOC or Tier 3: PFP without additional testing or documentation from Amazon. To achieve certification, your products will be evaluated to meet all requirements for Packaging Certification. Here at Purple Diamond we can assist with package design that meets the certification requirements of E-commerce and Amazon Packaging Certification! We can design packaging to; protect against damage, to reduce waste, and improve it’s cosmetic appearance. Packaging construction, packaging markings and ID label markings can also be designed into custom packaging shipping units. Purple Diamond can also evaluate and optimize over-sized products for E-Commerce and Amazon networks standards.